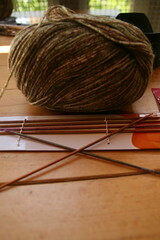 I’m currently binding off the last of my year experiencing the world of knitting, European style. Well, it was really for school but I did get to experience it through the various yarn shops of the world, such as in Crete, the Aran Islands, Barcelona, Porto, Amsterdam, Paris, and (sort of) Brussels. But more than yarn, more than different cultures, I saw more in life…and in my life. 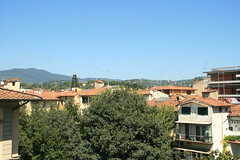 I saw different ways of living and measures of happiness. New lifestyles and priorities. Oh, and I definitely can’t forget all the different types of food and beer. Mmmm. Beer. As I get all sentimental, I also look forward to what’s to come this summer, such as work (still keeping my fingers crossed on the ever-progressing job search), reuniting with old friends, and uniting with new…as well as some ultimate (finally)! I can’t really discuss what I’ve learned or seen here, but frankly I’m at a new happy in my life. In knitting, we’re constantly counting our rows, stitches, etc. The only way I can be productive nowadays that I can feel summer in my bones is through a 30:10 ratio; 30 straight minutes of working, 10 minutes of knitting. Yay for finished SOCKS!! 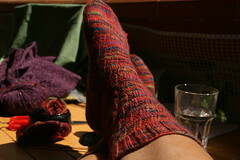 I finally got my Mockery socks off of my needles on a beautiful, knit-filled Thursday! 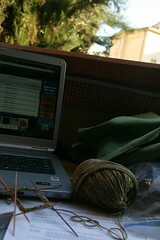 In honor of 2-day a week classes (in other words, Thursdays mean the weekend) I decided to spend the entire day on my balcony knitting away. 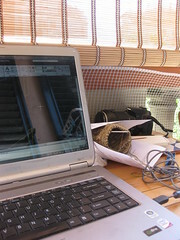 I’d have to say this setup is working beautifully for me on my days without class: computer, balcony, sunshine, and knitting (with the occasional beer/cider). 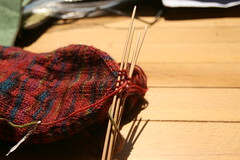 So right after I finished kitchener-ing my toes and as I was at the “Voila!” part of my double knitting, disaster struck! SHUCKS! I had a terrible cross between both and I am ashamed to admit what I did next; opened a bottle of S(C)IDER and SNIP! 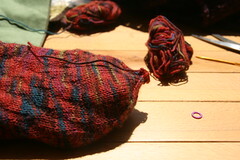 Please don’t look down upon me, but I was so over fixing crossed stitches and frogging and re-knitting, that I simply cut the yarn and retied it correctly. Hey, at least these are my socks, and not gifts, right? 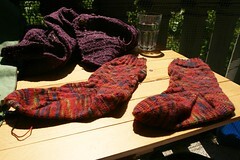 First pair of Amsterdam socks finished! I proceeded to have a finished product photo shoot. Unfortunately I don’t have anything I can block my socks with, so that will wait until my return to America…when I may possibly design my own and laser cut them!! After those were finished with some Vampire Weekend in the background, I finally got around to finishing my Milly vest which has been finished (at least pieces) for about 2 months now. 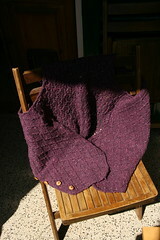 Finally, some SEAMING was done for this fella and she can finally be worn by yours truly! After a quick chore break, I proceeded to SWATCH my next pair of socks, Esther. I was going to make up my own pattern for this, but a) didn’t want to ruin my yarn by trying and frogging and b) I found the PERFECT pattern so I just couldn’t resist. 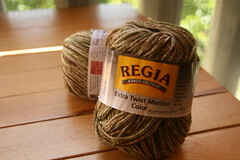 These are going to be done in my second set of Regia Extra Twist Merino Color yarn from Amsterdam as well. I really wanted a pattern that described my outlook on the city which was happy, cheerful, flower-filled, and cheeky so I looked to have a pattern with flowers. Success! So, swatching done, and SOCKS started, I still have two projects casted on, a scarf for my mother for Mother’s day (though it’s 21 days until I see her again!! Yay! – after 12 months of seeing my parents for a total of 6 days, I will be reunited with them in TWENTY ONE! I’m so EXCITED!!) I think I have a sock addiction…at least one sock has to be casted on at all times. I guess it’s not so bad, considering I seem to have a problem with NOT felting them…blast my occasional spacey-ness! 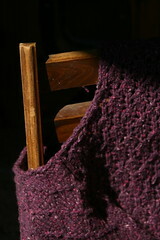 ’til next time, happy knitting!